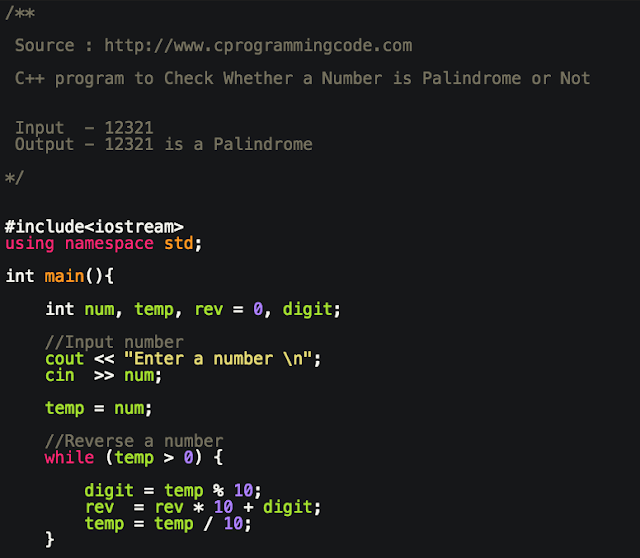 Write a c++ program to check whether a number is palindrome or not. In this program, we write a code to take an input number from a user and check whether a number is palindrome or not. Let's first understand what is a palindrome number? A palindrome number is a number that remains same when it's digits are reversed. i) 121 is a palindrome number. ii) 12321 is a palindrome number. How to check whether an input number is palindrome or not? ii) Reverse an input number. iii) Compare input number and reverse of an input number. If both are equal then entered number is a palindrome number.